As snow and ice storms hammer the nation, municipalities are employing high tech solutions and outside-the-box tactics to battle winter weather. As the mercury plummets, municipalities gear up to fight the inevitable snow and ice storms the long winter months bring. But some cities and states are going beyond the typical snowplows and salt brine, combating winter weather with high tech tools, new takes on traditional methods and outside-the-box solutions. The Nevada Department of Transportation (NDOT) is one of several state DOTs involved in the “Integrated Mobile Observation” project spearheaded by the Federal Highway Administration (FHWA). The project seeks to compile and analyze data gathered by response and roadwork vehicles across the country to create a complete, real-time picture of national weather conditions. 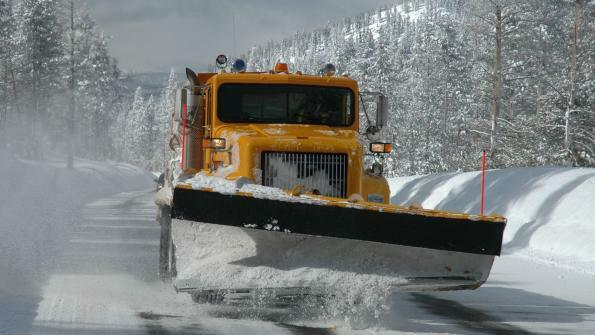 Denise Inda, NDOT chief traffic operation engineer, says the first phase of the project, which began about four years ago, outfitted 20 of the state’s snowplows and response vehicles with sensors to passively gather environmental information. Data collected includes road and air temperatures, humidity, barometric pressure as well as vehicle data, including ABS system and windshield wiper usage. This data is complied at the University of Nevada and then sent to the FHWA. The project is now in its second phase, extending data collection to around 40 vehicles and improving vehicle communication as well as data collecting methods, Inda says. Inda says the ultimate goal of the FHWA program is to get up-to-date information on road conditions into the hands of responding government agencies as well as drivers. This could take the form of an app, she said, that could digest the data and let drivers and responders know changes to road conditions in real time. 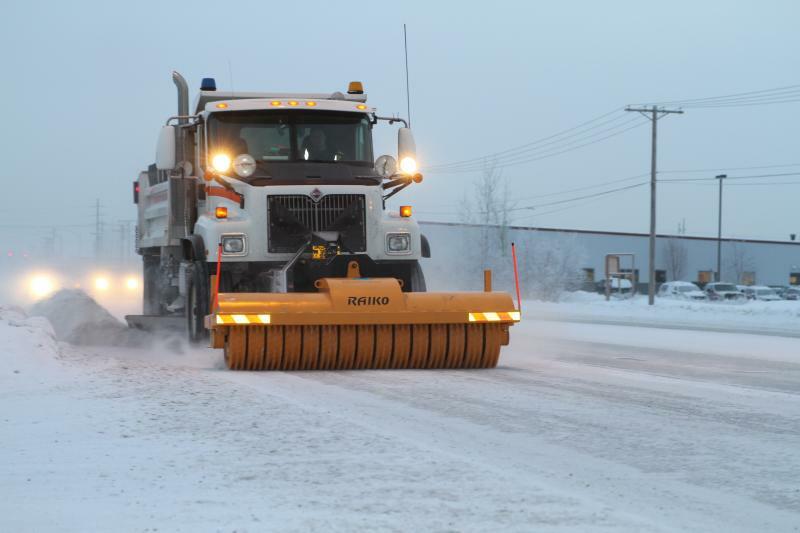 The number crunching could help the preventative actions of local governments – pretreating roads and strategically placing resources in areas with the highest likelihood of suffering winter storm-related problems. Nevada’s program is almost completely federally funded, with $250,000 budgeted for the second phase, says Inda. 95 percent of funding comes from federal grants, with the remaining 5 percent coming from state highway funds. Alaska, which fights a constant battle against snow and ice, added a new weapon to its arsenal last year – a metal-toothed icebreaker. Designed in Finland, the spike-covered roller crushes up hard-packed ice on roadways, improving traction for car tires and increasing the adhesion of melting agents. Alaska DOT and Public Facilities Chief of Statewide Maintenance and Operations, Mike Coffey, says the icebreaker, purchased last fall, was part of a pilot program, and to his knowledge is the first of its kind in the U.S.
Coffey says he was searching for a solution for the heavy icepack that covers Fairbanks’ roads during the winter. “Traditional methods of scraping it with plows wasn’t really working,” Coffey says. So instead of sticking to the time-consuming, ineffective method, he researched ways to break up the icepack, and, after browsing through Youtube videos of different techniques from around the globe, settled on the Finnish icebreaker from Raiko. The benefits are noticeable. Coffey says multiple residents have told him they can tell a difference between roads that have been plowed using the icebreaker and those that haven’t. “It’s been so successful I just bought two more,” Coffey says, adding each icebreaker costs around $40,000. Maryland, too, is experimenting with new equipment. 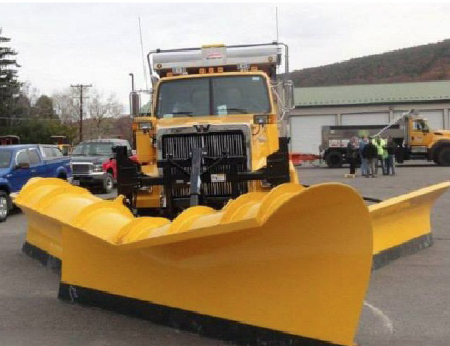 This year, the state increased its fleet of “duel-wing” plows. The brainchild of a Maryland DOT Shop Chief Steven Henry, the state’s duel-wing plows can do the work of three standard plows, clearing up to 24 feet of roadway, or two full highway lanes, in one pass, according to Dave Coyne, Maryland’s district engineer for Carroll, Fredrick and Howard Counties. The vehicles feature a front plow, and two extendable plows on either side that can be raised and lowered according to need. Municipal applications of potatoes are rather limited, but the Tennessee DOT has found an interesting use for the humble tuber. Jerry Hatcher, maintenance division director of the Tennessee DOT, says the idea originated in Hungary. Hungarians observed that ponds near a vodka distillery didn’t freeze during the harsh winters, and it was suspected byproducts from the distilling process had something to do with it. Fast forward a few years, and you have “Magic Salt,” a potato-based byproduct of rum and vodka distillation that is sold as a potent deicing agent, Hatcher says. Tennessee first used Magic Salt back in 2010, after DOT managers were encouraged to look for “outside-the-box” solutions for the black ice that plagues the winding mountain roads in the western half of the state. Estel Hagewood, the DOT transportation manager heading the state’s ice and snow program, said that in 2010, the Tennessee DOT bought a test amount of 200 gallons. It worked so well, the DOT increased to a tanker-load, or 4,200 gallons the next year. The quantity increased to 38,000 gallons the year after, and the department expects to purchase even more this year. “It’s less corrosive [than traditional salt brine], has adhesive properties and is environmentally friendly,” Hatcher says. Using the Magic Salt to pretreat roads before a storm causes less ice accumulation, and allows the DOT to use less material and manpower to clear the roads after the storm. Magic Salt can also be added to the salt brine mixture used to treat ice to make the solution more potent.